Two astronauts are taking a spacewalk outside the International Space Station today (March 24) to prepare the outpost for a new docking ring and other upgrades. NASA astronaut Shane Kimbrough and French astronaut Thomas Pesquet are expected to spend 6.5 hours working outside the station during the spacewalk, which begins at about 8 a.m. EDT (1200 GMT). You can watch the spacewalk live here, courtesy of NASA TV. Kimbrough, who commands the station's Expedition 50 crew, and Pesquet "will disconnect cables and electrical connections on PMA-3 to prepare for its robotic move Thursday, March 30," NASA officials said in a statement. That move coincides with the second spacewalk in the current series. "PMA-3 will be moved from the port side of the Tranquility module to the space-facing side of the Harmony module, where it will become home for the docking adapter, which will be delivered on a future flight of a SpaceX Dragon cargo ship," NASA officials added. Kimbrough and Pesquet are also expected to lubricate part of the space station's robotic arm, inspect a radiator valve suspected of a small ammonia coolant leak, as well as replace cameras mounted to the exterior of the station's Japanese segment, which consists of the huge Kibo laboratory module, a storage room and exterior porch-like platform covered with experiments. 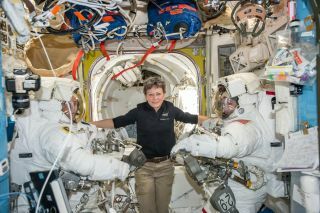 The next spacewalk in the three-excursion series is scheduled for March 30 and will be performed by Kimbrough and fellow NASA astronaut Peggy Whitson. The final spacewalk is scheduled for April 6 and will be performed by Whitson and Pesquet. Kimbrough, Pesquet and Whitson are three of six space travelers currently living on the International Space Station as part of the Expedition 50 mission. The other three crewmembers — Andrey Borisenko, Sergey Ryzhikov and Oleg Novitskiy — are cosmonauts with Russia's Roscosmos space agency. Visit Space.com for complete coverage of all three spacewalks at the space station.